This was going to be one of our light travel days or so we thought. The boys, Makaylah and I got up early and went down to the Casino's bowling alley for $1 bowling at 7:00am. After bowling a game, we joined Lisa and Makenzie in loading the van and then heading to breakfast. Traveling out of Las Vegas we went to the Hoover Dam. It is one of the most impression feats of human engineering. 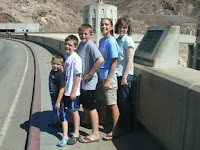 The picture is of the kids standing in Nevada (right foot) and Arizona (left foot) in the middle of the dam. 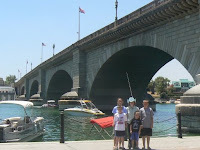 From the Hoover Dam we went south to Lake Havasu City, AZ to visit the old London Bridge. It is quite the drive into the desert and the Lake itself is impressive. We got out of the fan and hit heat that we NEVER have in Florida. I think it was over 100 plus extra from the heat index. The bridge was purchased and moved from London to Arizona by a man looking to preserve it and to bring some attention to his home area. Leaving Lake Havasu City we headed back towards Kingman, AZ to make our way to Williams, AZ for the night. About 20 miles west of Kingsman we noticed a real shudder in the back of the van and both back tires seemed to be shaking. 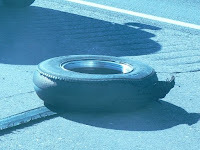 We pulled over and I used my unskilled, untrained ability as a mechanic to check the tires - nothing noticeable. We got back on the road and went 20 MPH under the speed limit. Pulled off again in 20 miles and let the van cool down and re-examined it again - nothing. Got back on the road and about 10 minutes later blew out the driver-side rear tire. We called AAA to come help change tire (not that I couldn't) so we could get a recommendation on who we could get a tire from on Sunday evening of a holiday weekend. The mechanic came and immediately called a tire guy who was still open (4:00pm) and was willing to stay open until we got there. $400 and 4 hours after the tire blew, we were back on the road with new tires (the one that blew and 2 others were original tires - 6 years old with only 48,000 miles). Instead of arriving in Williams around 4:00-5:00pm we got in around 9:00pm and needed to get to bed to get up by 2:20am to head to the Grand Canyon. 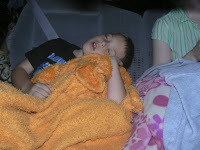 As you can see, the kids were wiped out by the time we got there. Our only lingering issue with the van (besides some finishing attachments to the back panel near where the tire blew) is that the gas line (from where you put gas into the van) is not attached as it should and leaks when gas is being put into the van (not after it is in the tank only when in the line going into, not out of, the tank). I have crawled under the van several times and tried to tape it, and it has slowed or temporarily stopped the leak. It will be good until we get home. What an adventure!